I used a Watec 120N deep sky video camera running through a Synta 6″ F5 refractor to display a real time image of ‘The Flame Nebula’ NGC 2024 on a TV monitor. This image was Superior to that at the eyepiece of my 14″ F5 Newtonian on which the refractor rode even when employing a UHC filter! Using light weight black card, white watercolour pencils and blending stumps I attempted to record the spectacle as best I could, resulting in this scanned and totally unprocessed image. A sketch of what is, essentially, a photograph is, while not a sketch at the eyepiece, still a sketch. But with thousands of good sketches from the eyepiece to pick from, I have to say that this one does not belong here. Additionally, I feel for the artist, who obviously observes in light-polluted skies. 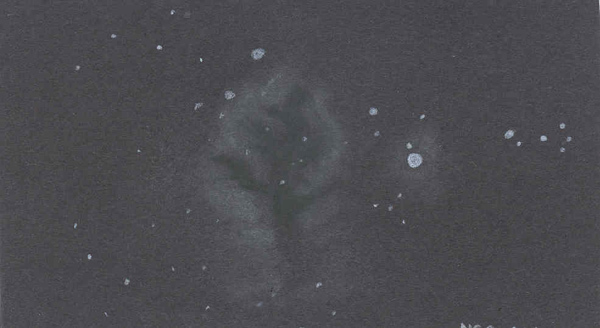 What he shows in his sketch is less than what an 8″ shows from the eyepiece at a dark site. Don, thank you for your opinion on this sketch. I believe that honesty and constructive criticism play as important a role as praise does. It can help us all analyze how we feel about the process of sketching. Still, I personally disagree with the statement that “the sketch does not belong here.” It’s true that this site is still in its infancy and may yet make some course corrections. However, Dale was up front about how he achieved the sketch, and visitors can individually decide whether they like that method or not. One of the benefits I believe this site will offer is to expose people to a wide variety of media and methods for astronomical sketching. Not all methods will suit everybody’s tastes or sensibilities. I’m aware of a few amateurs who observe from a live video display (whether from a CRT or a video eyepiece such as the Collins I3). The reasons they use them vary, but I see no reason to discourage folks from sharing the sketches they make while observing with these devices. I’d say, if you took a photograph of the object, developed that photograph and the simply make a copy sketch, that’s what I’d call a “false” sketch, however, as long as there is viewing involved and real work at the telescope, I’d say there is nothing wrong with it, I mean, we basically agree that we look at the objects and then we try to put down what we see on paper as accurately as possible, the best that we can. I don’t think it matters, which way we look at them, directly through the eyepiece, on a screen, as long as the whole process is “live” – at least for the rough sketch or the outline. I use my Watec & monitor screen as a large eyepiece, it is certainly closer to drawing from a standard eyepiece than it is to copying a photograph( seeing comes & goes details pops in and out of vision etc). I do work at the ep when the view is worth recording but if dissapointing I put the camera on a try that way, so in my mind too it is second best. I was reviewing through the early sketches posted here and I found the beauty. Great sketch.